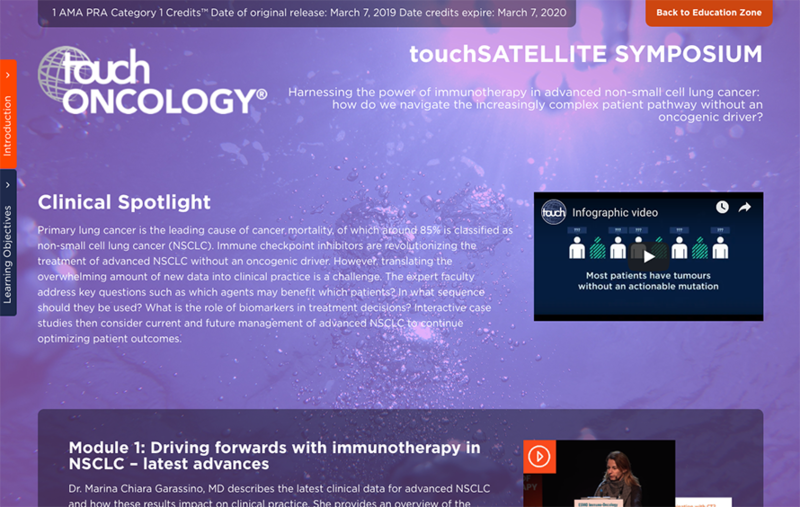 touchIME is the education division of touchONCOLOGY, we pride ourselves on providing innovative independent learning activities for busy healthcare professionals. 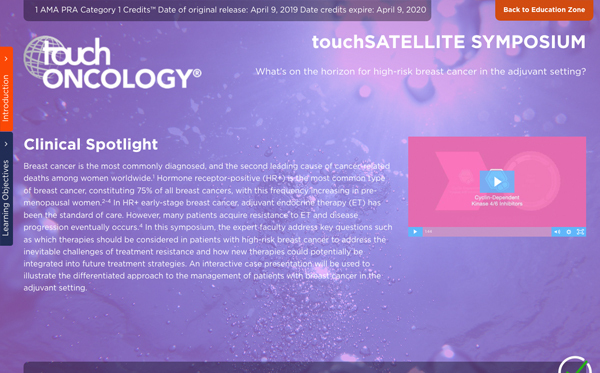 Watch the footage from our Satellite Symposium at the 2019 St. Gallen International Breast Cancer Conference, with an internationally renowned expert faculty discussing the changing landscape for adjuvant treatment of patients with high-risk breast cancer. 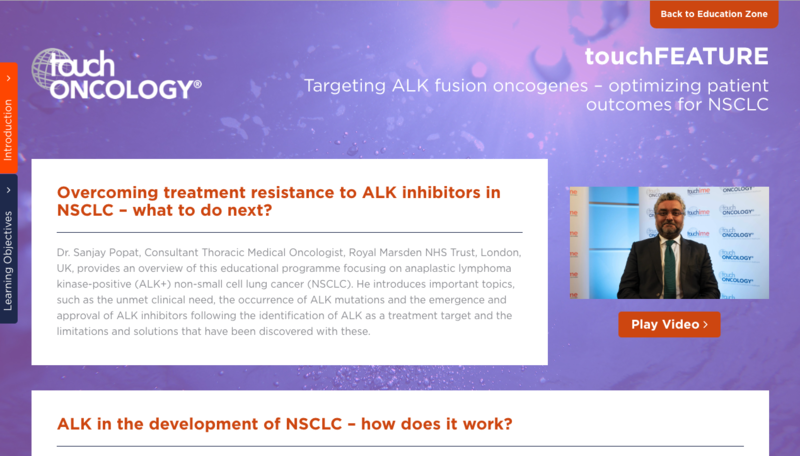 Watch internationally renowned experts discuss the diagnosis and management of patients with ALK+ NSCLC, review the changing treatment landscape and consider how to optimize outcomes. 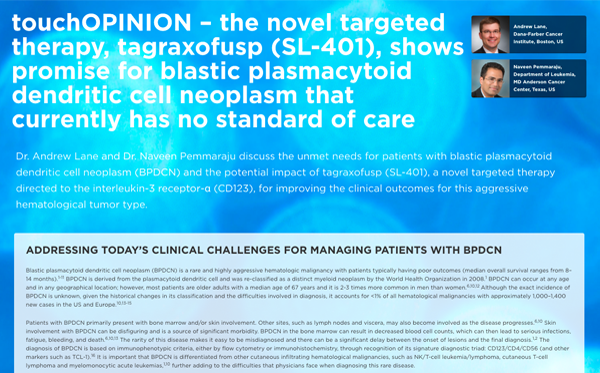 Watch the footage from our Satellite Symposium at ESMO-IO 2018, with internationally renowned expert faculty discussing the role of immunotherapy in the rapidly evolving treatment paradigm for NSCLC without an oncogenic driver mutation. 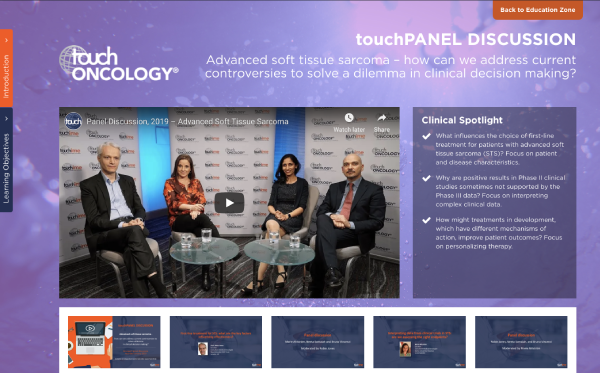 Watch a panel of internationally renowned experts discuss the factors influencing the choice of first-line treatment for patients with advanced soft tissue sarcoma and the interpretation of data from clinical trials in this patient population. Watch internationally renowned expert, Professor Stephen Johnston, discuss key data in advanced breast cancer presented at the San Antonio Breast Cancer Symposium (SABCS) 2018 Congress, 3–8 December 2018. 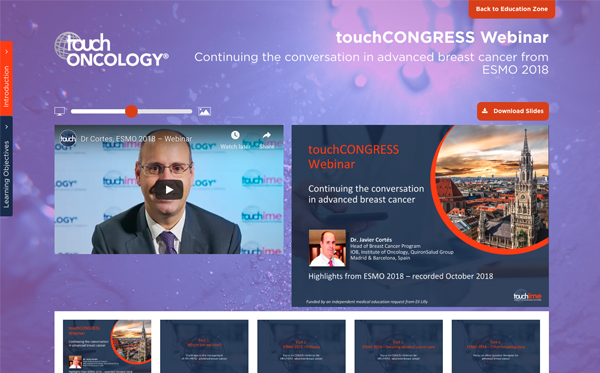 Watch leading breast cancer clinicians from Europe and Japan discuss the latest data from the San Antonio Breast Cancer Symposium (SABCS) 2018 Congress, 3-8 December 2018, and what they may mean for global and regional clinical practice. 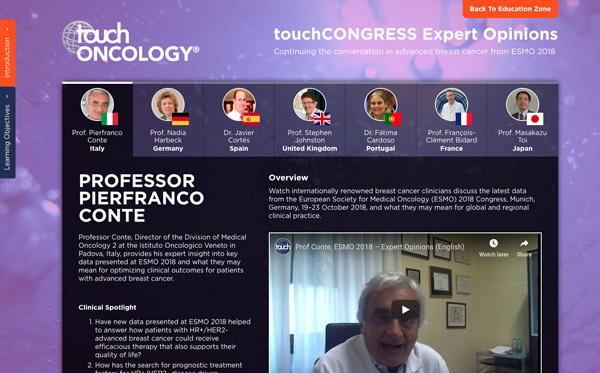 Watch internationally renowned expert, Dr Javier Cortés, discuss key data in advanced breast cancer presented at the European Society for Medical Oncology (ESMO) 2018 Congress, Munich, Germany. 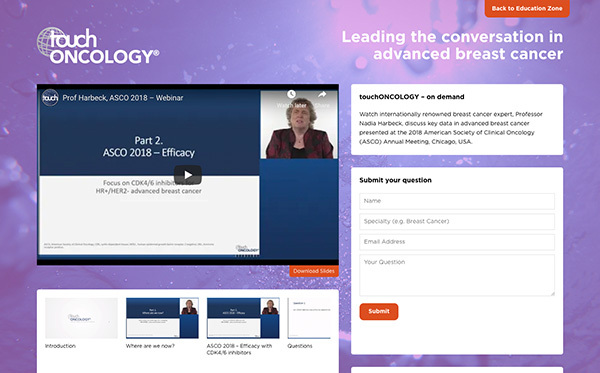 Watch leading breast cancer clinicians from Europe and Japan discuss the latest data from the European Society for Medical Oncology (ESMO) 2018 Congress, Munich, Germany, and what they may mean for global and regional clinical practice. 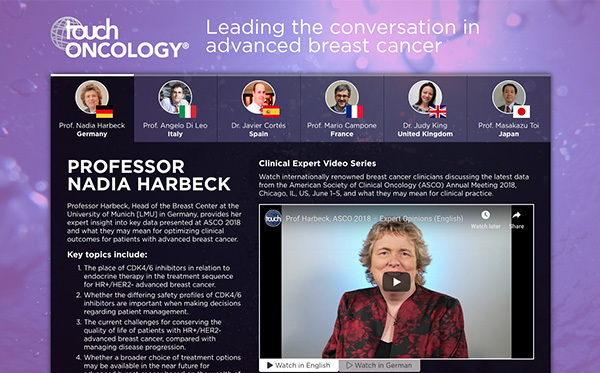 Watch internationally renowned breast cancer expert, Professor Nadia Harbeck, discuss key data in advanced breast cancer presented at the 2018 American Society of Clinical Oncology (ASCO) Annual Meeting, Chicago, USA. 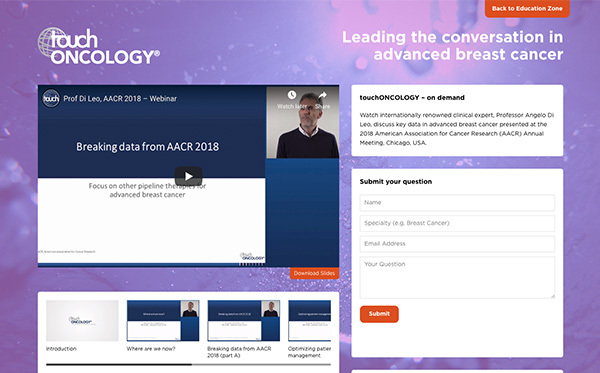 Watch internationally renowned breast cancer clinicians discussing the latest data from the American Society of Clinical Oncology (ASCO) Annual Meeting 2018, Chicago, IL, US, June 1–5, and what they may mean for clinical practice. Watch internationally renowned clinical expert, Professor Angelo Di Leo, discuss key data in advanced breast cancer presented at the 2018 American Association for Cancer Research (AACR) Annual Meeting, Chicago, USA. touchIME develops practice changing educational resources that have a positive impact on knowledge transfer with the objective of improving patient outcomes. Our learner first approach ensures these resources are delivered in multiple formats and can be accessed via multiple platforms, including mobile, allowing today’s on-the-go healthcare professionals to enhance their knowledge and skills at a time and in a place that suits them. 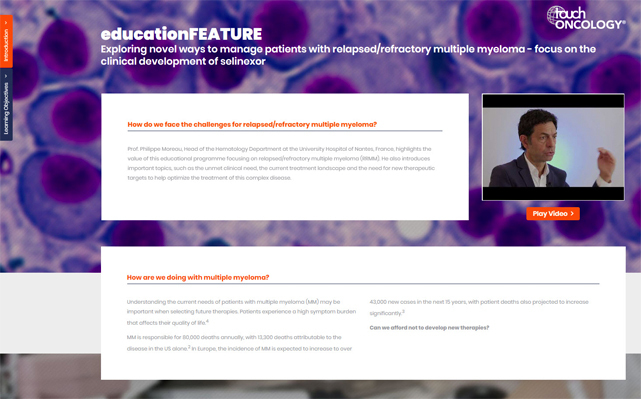 Our education resources are developed in collaboration with our well established, peer-reviewed medical journals, our Editorial Board members and partnerships with major medical societies, with a clear commitment to high-quality independent education.